ok so i had a fried rectifier and plug on 97 hawk. bought new stator, new rectifier new battery, hard wired rectifier to eliminate plastic plug. 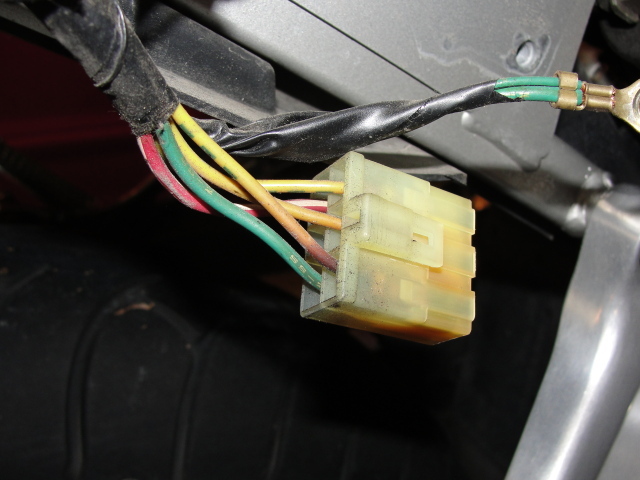 now with bike off completely just noticed the red wire+ going into rectifier is hot. WITH BIKE OFF. is this normal or do i have a ground issue somewhere? if so, where would i look. It's not normal and "hard" wiring was probably not a good idea. Can you post a pic of this plug-less connection? Last edited by Wolverine; 06-07-2017 at 06:15 PM. Sounds like you have your wires crossed somewhere. Compare to an OEM plug and confirm red and green are proper (I can't tell from your pic). Yeah just carefully recheck the wire colors. You should really get a plug they are cheap. There is a really solid reason that all these OEMs with all their R&D money do it with a plug. Also why did you replace the stator? They don't usually die. Was it fried or melted? well the reason we bypassed the plug was a wire was burnt in the plastic connector to rr. Along with the plastic connector and a prong coming out out the rr. I read numerous threads saying the plastic was cheapo and couldn't handle the heat. And how to bypass it. My voltage wasn't getting higher as rpm increased so got new rr. Figured stator was 20years old plus 20k miles might as well get a new one. Certainly won't hurt you to change the stator. Maybe wasn't necessary but it's done so no worries. 3 yellows that are from stator do not matter which is where, as long as they are all front row, like my pic. Cross the green and red and you're gonna cause problems. Wiring must be 100% correct. Have you read the threads about upgrading to a mosfet R/R? Would have benefited you immensely as the plug gets tossed. The entire factory manual is posted in the Knowledgebase section. Get that and a volt ohm meter to your dad and he can sort it out. yes we have that and all wires have continuity and all ground are good. No burnt or fried wires or buildup. And the manual doesnt explain or tell what to do for the one positive wire going into rectifier always being hot? Might be an idea to disconnect the battery while you fiddle with electrics - esp if live and if it's possibly wired back to front. Have you a pic of what you've done - rather than a pic from the internet of someone elses R/R. Last edited by Wicky; 06-08-2017 at 08:07 AM.